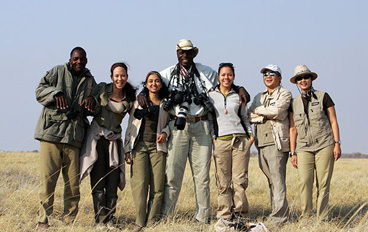 Africa's green season is generally the most exciting time for birding in Africa. The migrants are present and many endemic birds are in full breeding plumage. All big game safari enthusiasts eventually develop an affinity for Africa's birds – whether towards the continent's majestic raptors or giant flocks of flamingos, storks or ibis, or its colourful bee-eaters and everyone's favorite, the lilac-breasted roller. There is also a growing community of bird watchers – with their lifelong bird lists in hand – who plan their safaris with specific birds in mind. With vast expanses of largely undisturbed wilderness, plenty of wildlife and a great diversity of habitats – Botswana is a great destination for bird-watching. 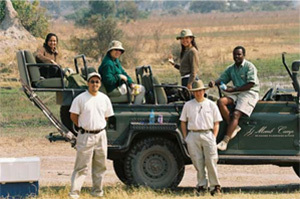 The Okavango Delta stands out as not only a top area for game, but also one of Africa's ultimate birding destinations. Over 400 species of birds have been recorded in South Luangwa National Park and in spring beautiful and gregarious carmine bee-eaters arrive for their annual breeding season. Zambia's Bangweulu Wetlands is home to a large variety of water birds, including the rare shoebill stork. Southern Tanzania's main parks – the Selous Game Reserve and Ruaha National Park – are home to many East African species that are not found in southern Africa. In the north, Lake Manyara National Park is home to almost 400 different bird species. Large flocks of flamingos and pelicans are usually found on the lake. Lake Natron is the main flamingo breeding site in Africa. The Rift Valley lakes, particularly Lake Nakuru and Lake Bogoria play host to millions of flamingos. The wet season is the best time for bird-watching in Namibia. Sandwich Harbour is a prime birding spot and flamingos breed in Etosha when the pans fill and flocks of blue cranes descend upon the park. Namibia's best area for birds is certainly the Caprivi Strip, where many species usually associated with Botswana's Okavango Delta can be found. Many islands in the Seychelles offer protected habitats for endemic and endangered species of land-based birds and huge colonies of sea-birds. Bird Island, a small island in northern Seychelles offers one of the most spectacular opportunities to observe sea, shore and land birds in massive numbers comparable to the Galapagos Islands. With no natural predators, they display little fear of humans, allowing incredibly close contact.